The 31st edition of the Foyle Film Festival opened on Friday night, November 16th, with a packed out screening of Keira Knightley’s latest release ‘Colette’ at Brunswick Moviebowl. The screening, which was the film’s Northern Irish premiere, sees Keira Knightley give a remarkable performance as the eponymous feminist author who defies both her husband and societal gender expectations to fight for creative ownership. ‘Colette’ was seen as the perfect film to kick off the festival programme, with this year’s theme being ‘Voices’. The programme contains over 100 films, eclectic in scope and theme, which in one way or another, give voice to those who historically have been excluded from narratives. Edwin Thomas, acclaimed actor and star of ‘The Happy Prince’ and ITV’s ‘Victoria’ was also in attendance to get the festival proceedings underway. The festival now looks ahead to a dynamic 10 day programme, including many more premieres, features and documentaries, in addition to Q&As with notable special guests including Ed Moloney and Vanessa Redgrave. The Light in Motion Competition, which also kicks off this weekend, will run for the duration of the festival. The competition, which is Academy® Award affiliated, has gained international recognition and a reputation for nurturing emerging film-makers. Previous winners and competitors who have proceeded to win the Oscar® include Martin McDonagh for ‘Six Shooter’ (2006) and Andrea Arnold for ‘Wasp’ (2004). 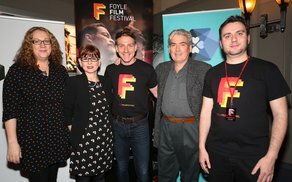 Foyle Film Festival is funded by the Department for Communities through Northern Ireland Screen, Derry City and Strabane District Council and Tourism Northern Ireland. The Festival is also receives support from City of Derry Crystal, and venue partner Brunswick Moviebowl.